The first edition features the moraines surrounding Wallowa Lake. We were lucky enough to get to camp on the banks of this breathtaking lake last year during the Classic and it truly is a special place. Grants from Cycle Oregon have been instrumental in helping to protect these sacred formations from development for the last 11 years. And just last week we heard more amazing news about the moraines. 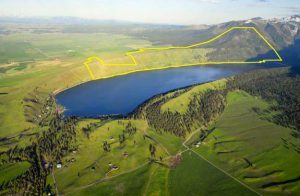 The the Wallowa Lakes Moraines Partnership reached an agreement to purchase 1,800 acres of the east moraine from a private family to make that land county-owned by 2020! This means 60% of the east moraine will be conserved, converted into responsibly managed forest, and handed over to the community. This exciting new purchase perfectly aligns with the Partnership’s goals of maintaining sustainable working landscapes to contribute to the local economy and rural ways of life, providing public access respectful of the landscape and its scenic beauty, and protecting open space for wildlife, recreation and natural resources. The uniquely unspoiled nature of this area will live on and we are thrilled to have been part of it.